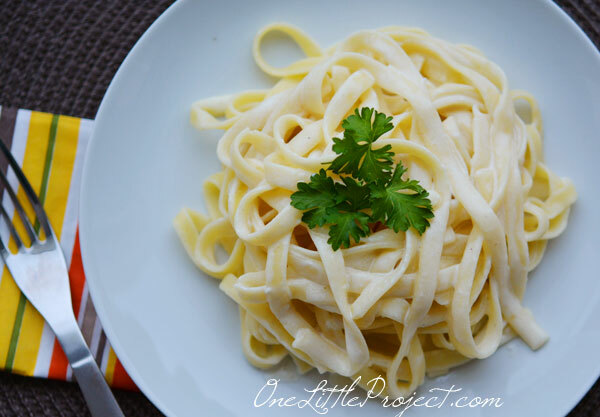 This recipe for homemade alfredo sauce is delicious! 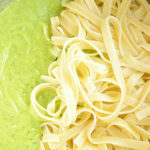 It’s thick and creamy, and made with fresh ingredients you can feel safe feeding to your family. 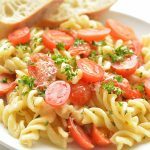 It comes together in less than 10 minutes and tastes absolutely amazing on your favourite pasta! Add minced garlic and cook for 2 minutes. Add cream cheese and whisk together. Add cream a little at a time while whisking. Heat until bubbling, but do not boil. 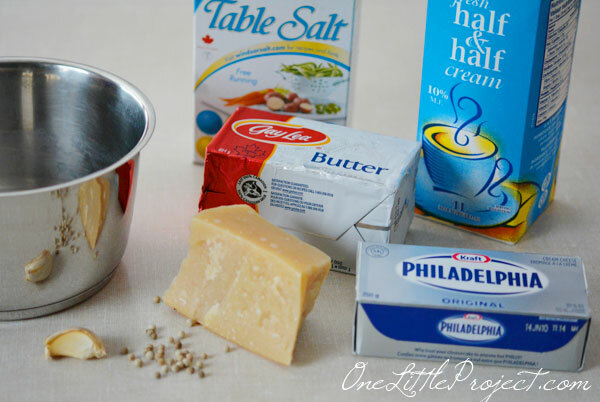 Add in parmesan cheese and mix until the cheese melts. 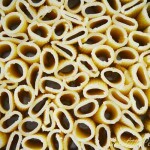 Toss with your favourite pasta. 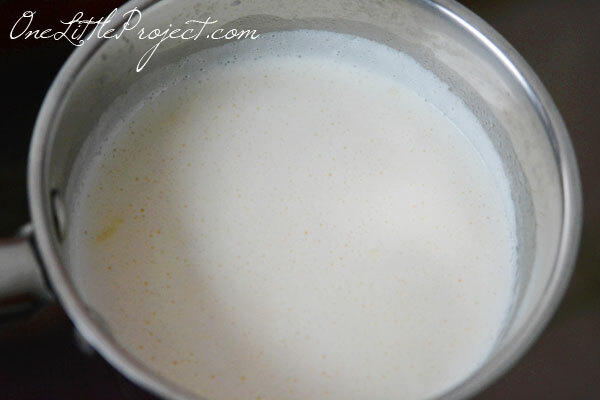 If the mixture thickens too much, add more cream. If it’s not thick enough, add more cream cheese. 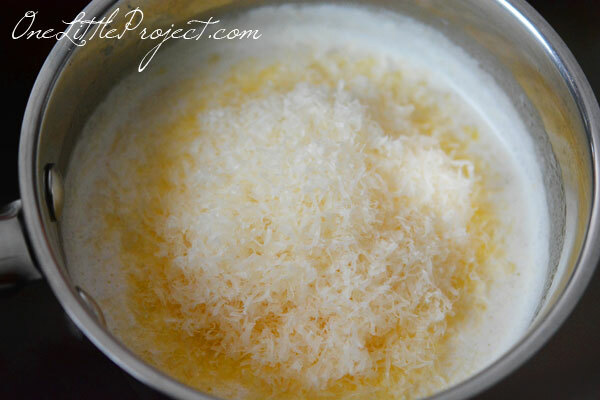 Freshly grated Parmesan cheese really is the way to go for this recipe. 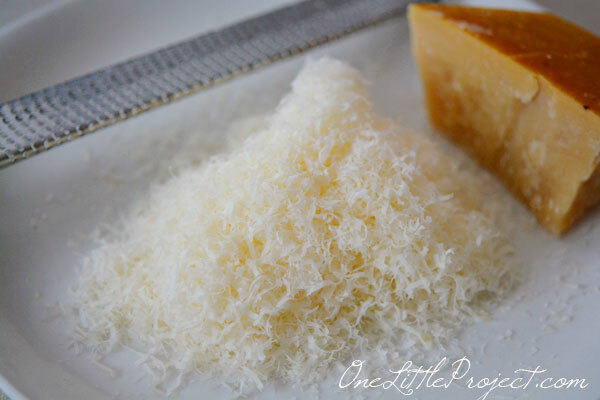 You’ll need a really good grater and some good quality Parmigiano Reggiano . You can still use the powdered kind of Parmesan that comes in the round container but it will definitely have a slightly different flavour. 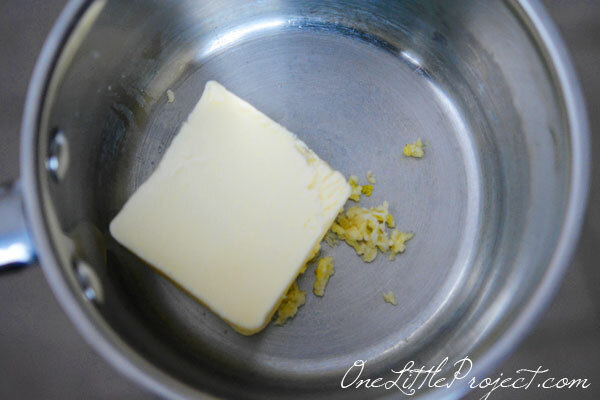 Melt the butter with the minced garlic, and cook for about 2 minutes. Can’t you smell this already?? Many recipes call for milk instead of cream. I’ve never tried it, but I would imagine it would taste just as good, and it would end up being way easier on the waistline! Whisk like crazy while you are pouring the cream in. It takes a bit of effort to get rid of the cream cheese lumps. Just before it comes to a boil, remove it from the heat. It will start to bubble slightly, like in the photo above, but it’s really just froth. Add the grated Parmesan cheese and stir it to let it melt in. 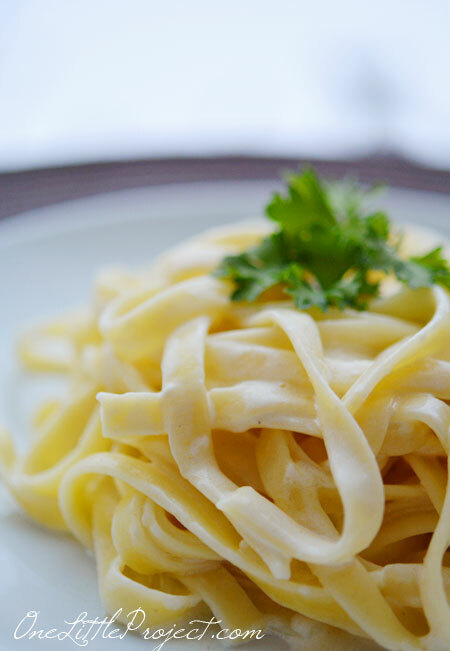 Toss it with your favourite pasta and you have the most delicious alfredo sauce ever! If it wasn’t made with cream and loads of butter I could have eaten it like soup! I’ve never really been a huge fan of jarred alfredo sauce. I’ve always found it too garlicky, too salty, or too processed. It just wasn’t quite right. This sauce, on the other hand, actually tastes like real home cooked food. What a nice change to feel like I’m eating something full of fresh ingredients that you can actually pronounce! You know those dinners, where you just can’t bare the thought of cooking a full meal for your family? This recipe is perfect for those nights! It’s quick and easy, but still delicious enough to actually serve to others too. And if you end up with any leftovers, the homemade alfredo sauce will keep in the fridge for several days. We all know about adding this to pasta, but it’s also a terrific sauce to add on top of vegetables (I bet those brussel sprouts or broccoli would taste way better with this sauce!). Or you can even add this homemade white sauce to your favourite casserole instead of using a can of soup. Keep the ingredients on hand, and you can whip up a delicious meal in less than 20 minutes! Your Alfredo Sauce looks fantastic! Hope you had a great weekend and thank you so much for sharing your awesome recipe with Full Plate Thursday. Have a good week and come back soon! HI! Visiting from ABFOL Linky Party! 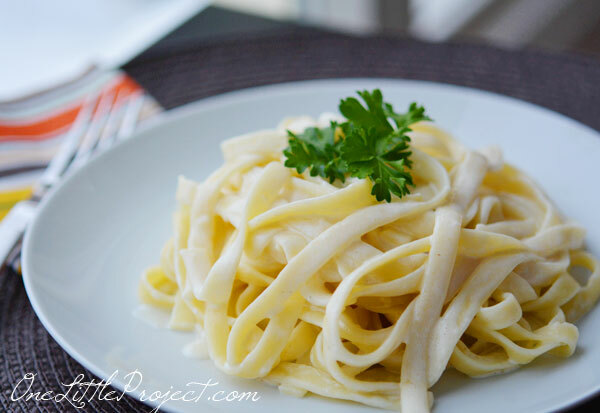 Your alfredo sauce looks amazing! If I hadn’t already eaten dinner I would be in the kitchen right now trying to whip this up!! Thanks so much for sharing! 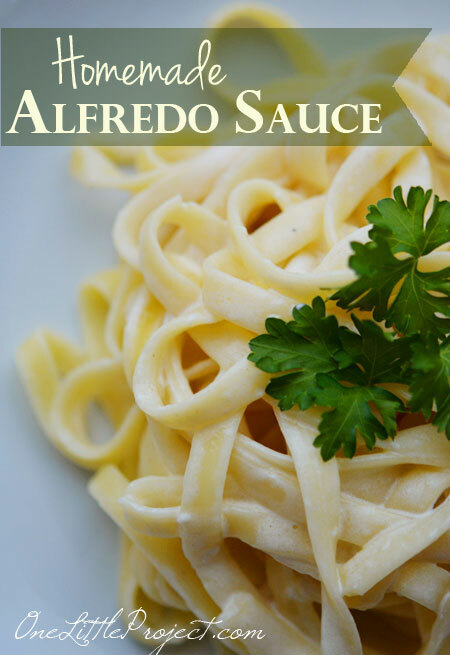 This alfredo sauce sounds AMAZING! I haven’t had alfredo in a long time, but this definitely makes me want to give it another go because it was one of my favorites as a kid. YUM! Also, this was one of my favorite recipes featured on last week’s That’s Fresh Friday link-up! I’ll be featuring it at my site tonight as we launch this week’s link-up. Thanks so much for participating, and keep up the great work! Sounds delicious, I can imagine that it work well with added chicken or bacon even. Thanks for linking up to Sweet and Savoury Sunday, stop by and link up again. Have a great weekend!! 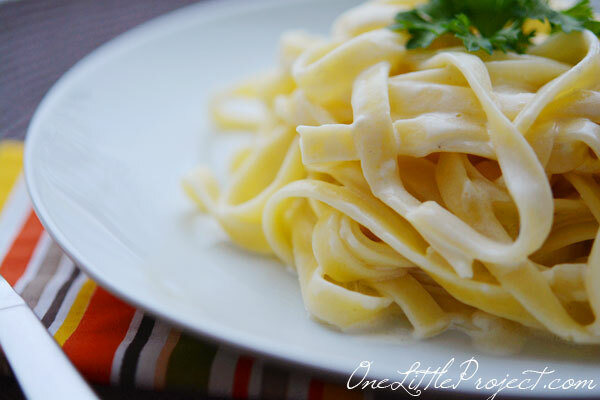 Made this alfredo sauce tonight, and it was absolutely delicious! Best alfredo sauce ever! Just made this!! 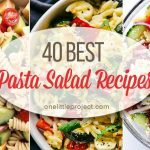 It is the best Alfredo recipe. My kid’s friend was over for dinner and he loved it! My kids are too picky to eat it. What is the serving size for the sauce? There is only two of us so I was thinking of halfing the recipe. Oh… hmmm… it was a long time since I made it, but I know I had leftovers! I’m pretty sure cutting it in half would be plenty for two people. Or if you are worried, it will store in the fridge for at least 5 days. can i substitute the cream cheese? or remove it all together? I made this tonight and the butter separated from the sauce and became lumpy. What did I do wrong for this to happen?